The Kennett Township Supervisors voted 2-1 Tuesday night to grant Longwood Gardens a permit to raze these three 1920s cottages along U.S. 1. For more than half an hour Tuesday night, planners, preservationists, and members of the public urged the Kennett Township supervisors to delay a decision on granting Longwood Gardens a demolition permit for three 1920s bungalows on U.S. 1. Despite the impassioned pleas, the Kennett Township Supervisors voted 2-1 to grant the request during a work session. The township’s Planning Commission had sought additional time to explore other options, such as finding alternative uses or relocating the buildings. Describing Longwood Gardens as “a good neighbor for many years,” Supervisor Robert A. Hammaker introduced the motion to grant the permit, which was seconded by Supervisors’ Chairman Michael E. Elling. Supervisor Scudder Stevens cast the lone dissenting vote. At the April 15 supervisors’ meeting, Elling said the supervisors would have three options when they voted: grant an additional delay up to 45 days, grant the demolition permit outright, or grant the permit with conditions. Before the vote, Stevens said the Planning Commission had worked on five possible conditions, such as requiring Longwood to reimburse the township for its expenses in researching the houses or having Longwood build a walking path around the affected area. He questioned why the conditions were not part of the discussion. Stevens also read excerpts from eight letters submitted to the township. Only one, from the Kennett Township Historical Commission, supported the demolition. Most, authored by groups ranging from the Preservation Alliance of Greater Philadelphia to Pocopson Township, recommended that the township exhaust all alternatives before taking an irreversible step. 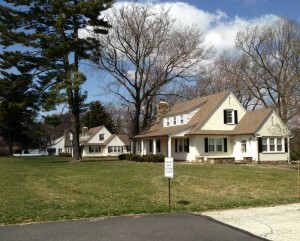 Mary Sue Boyle, a historic preservation consultant hired by the township’s Planning Commission, suggested that with 1,100 acres and $1.23 billion in assets, Longwood possessed the means “to accommodate these historic resources.” She questioned whether tearing down significant homes deemed “structurally sound” by an engineer represented the “sustainable environmental stewardship” Longwood advocates. Mary Ann Rossi, an attorney for Longwood Gardens, said the decision to raze the buildings was not easy but was clear. “It’s a value judgment,” she said. Returning the swath of land near the gardens’ entrance to a 19th-century-style agrarian landscape “is more in line with Longwood’s mission, vision, and values,” Rossi said. Asked by Ellis whether the Longwood and Kennett Fire Companies could use the buildings for training purposes before they are destroyed, Rossi said yes. After the meeting, Elling said he had no information on Longwood’s timetable for razing the buildings, which were commissioned by Pierre S. du Pont to house some of his Longwood Gardens’ staff. Elling said the fire companies would use the structures to simulate emergencies. He said they would not burn the buildings but would use fake smoke and access the homes to put out the faux fires. “Stuff will get broken,’ he said. Rossi was unavailable for comment after the meeting.